Our front plate-- LEDs added later. Seven buttons for 6 different types of tea! Our SolidWorks model, which we used to laser-cut the structure. We were inspired by Maura's love for tea! It's little-known that different teas require different steeping times and temperatures. Tea-licious makes it easy to brew a perfect cup of tea every time. 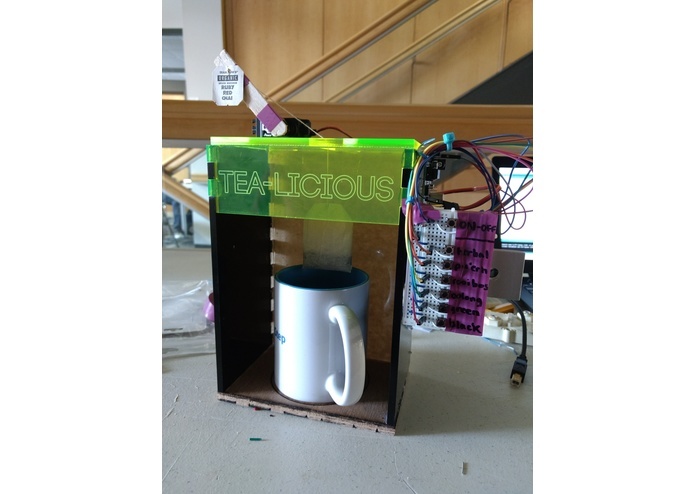 Tea-licious allows the user to insert a cup of hot water and a teabag, press a button, and relax while Tea-licious brews a delicious cup of tea! There are settings for herbal, green, black, rooibos, oolong, and pu'erh tea. Each type of tea must steep at a different temperature for a different amount of time. 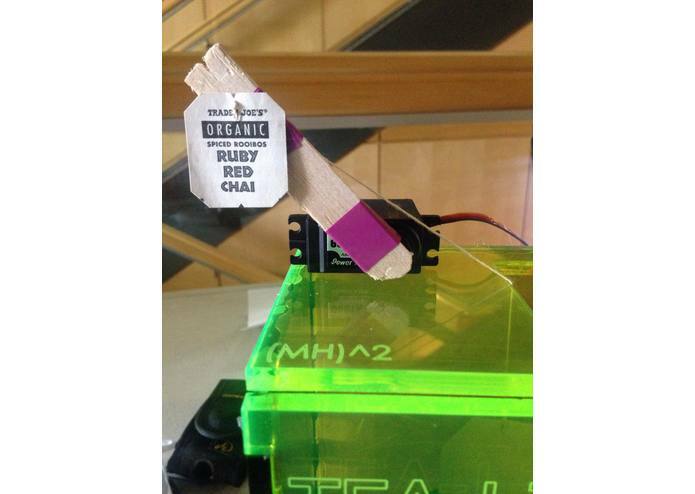 Tea-licious assumes that the user inserts a cup of boiling water (100 degrees Celsius)-- we utilized the known relationship between time and temperature of cooling water in ambient air to determine cooling times for each type of tea. Then, Tea-licious "dunks" the teabag in the water for the corresponding steeping time, lifting it out every minute to facilitate diffusion. 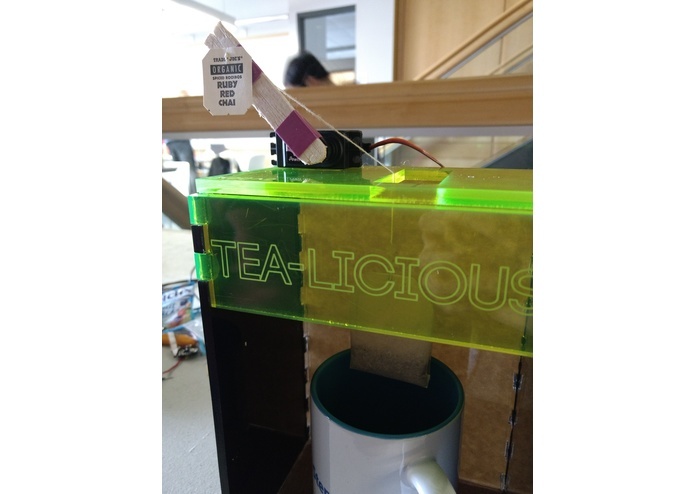 Tea-licious's LEDs let the user know when it's safe to interact with it. They flash from yellow to green when Tea-licious is turned on, light up red when the tea is brewing, and return to green when the tea is done. 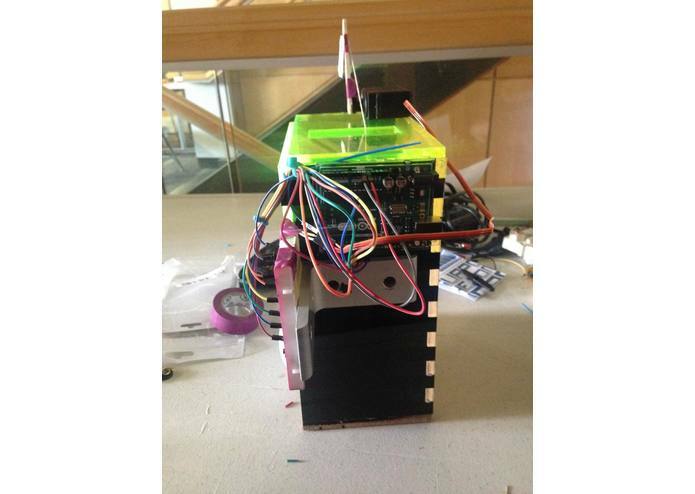 We modeled the structure in SolidWorks, laser-cut it out of acrylic and wood, and put it together with hot glue. We incorporated joints that fit together to ensure the structure would be square. 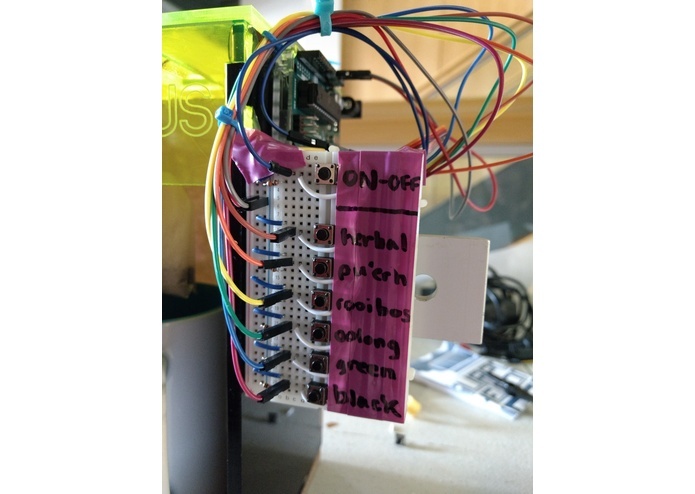 The "brains" of the operation is an Arduino Uno, which is connected to 7 buttons and controls a servomotor and colored LEDs. It took some time to determine how our code would be structured to enable user input and implement a control loop. The height of the structure also required some thought, as did our wiring. Another challenge was that there are many conflicting sources on the correct temperatures and steeping times for various teas. We tried to find a happy medium among all of them. Tea-licious works reliably, and gives user feedback to make it easy to use. 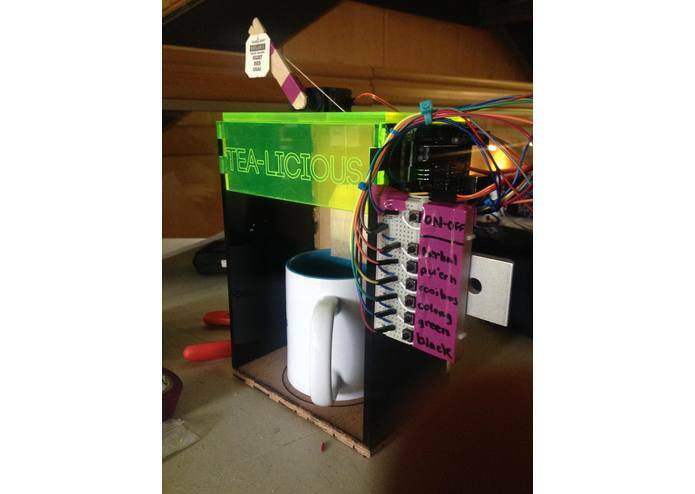 We're really excited that we took Tea-licious from idea to reality in under 24 hours! We learned that wirecutters are feisty! 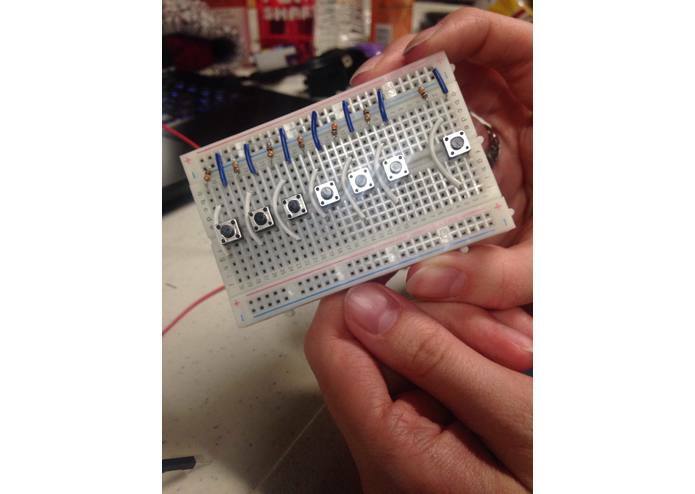 Maura learned more Arduino code, and Madee learned a lot about tea! 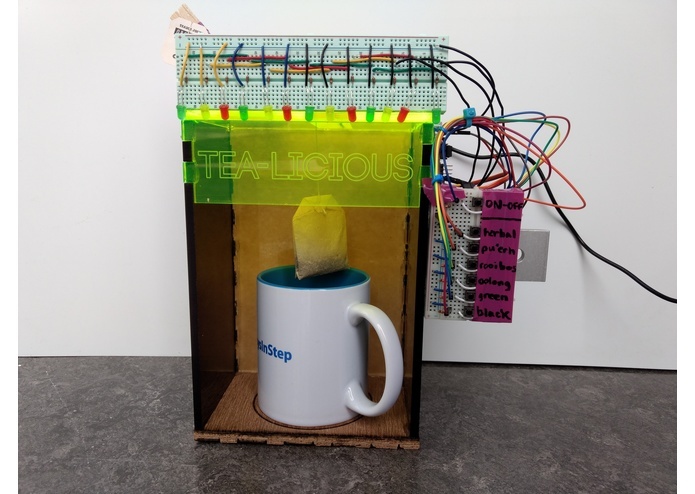 Next, we'd like to incorporate a heating element and temperature sensor so that Tea-licious can brew the tea from start to finish. We would also like for the user to be able to add more settings for other types of tea, or customize the current settings. 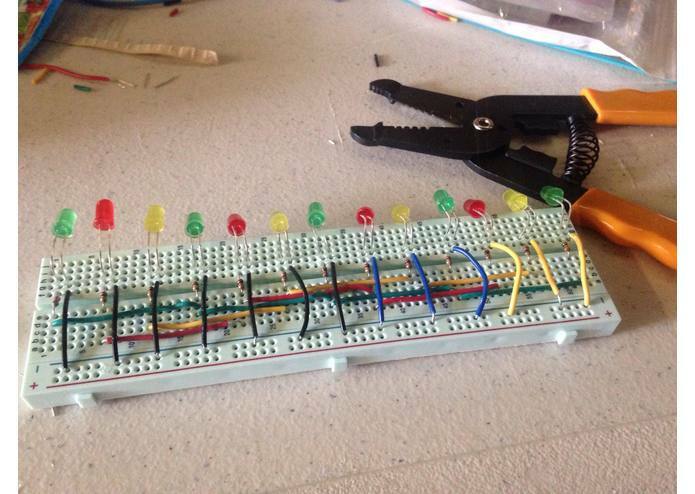 We might also add a buzzer or a screen to communicate with the user more effectively. If we were to make Tea-licious into a consumer product, we would incorporate custom PCBs and a more aesthetically-pleasing user interface. 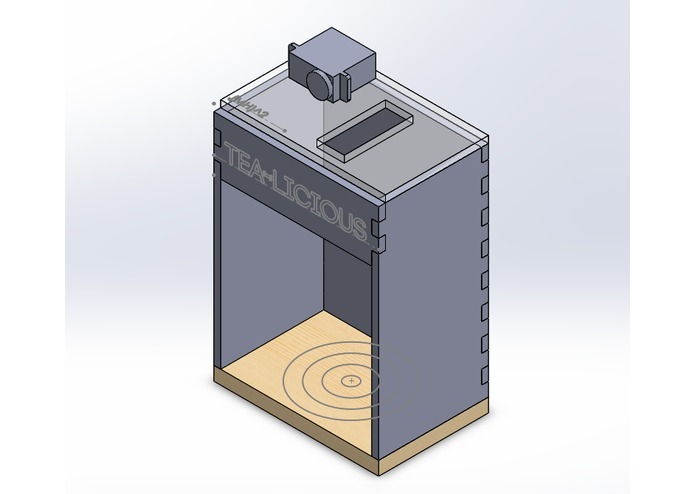 I wrote Tea-licious's Arduino code and modeled the structure in SolidWorks.